Tue., Nov. 22, 2016, 2 a.m.
PULLMAN – There is a chance of snow for Friday’s Apple Cup, but almost no chance of powder like we saw back in 1992. The “Snow Bowl” took place in a blizzard, much to the delight of a few Gonzaga Prep sophomores. Michael Baumgartner and Steve Gleason, who was an All-America football player at Washington State and is an outspoken activist on behalf of people with ALS, and some friends went to the game and were seated near the Husky band. Young rapscallions that they were, and extra rambunctious no doubt on their favorite team’s play in the eventual 42-23 WSU win, the boys threw some snowballs at the musicians. Perhaps extra points were given to whoever could land an icy orb in the tuba. Fast forward to 2015. Baumgartner is a state senator from Spokane and has just been introduced to Jessyn Farrell, a first-year member of the state house who sees all of the WSU paraphernalia Baumgartner keeps around his office and mentions that she went to Washington. Washington state’s own roundabout version of The Caning of Charles Sumner may be an extreme example of the manner in which the Apple Cup touches the lives of those who grow up in the Evergreen State, but everybody has a story. Neither UW nor WSU is making players available to the media this week, for fear that acknowledging the rivalry and the game’s importance will serve as a distraction. Since the players are too focused to provide any insight into the Apple Cup, we will let some other Cougars and Huskies do the talking for them by passing along some stories that show the nature of the rivalry. Hopefully, WSU associate athletic director and sports information director Bill Stevens will not mind us sharing that he grew up with Chris Petersen in California. Before Stevens went on to star as a tennis player at WSU and Petersen became the UW head coach, the Yuba City boys would occasionally play a game of tennis at the club where Petersen’s mom worked. And if Stevens does mind? Fine, let us talk to players or something. Those players of course have a special relationship with the rivalry, since they are the ones tasked with giving their respective fans gloating rights. Linebacker Jeremiah Allison played at WSU from 2012 until 2015, and would recall the scorn he felt when visiting his cousin, Jaydon Mickens, who played for the Huskies, on the UW campus and from Mickens’ teammates. Perhaps nobody has more of a connection to the Apple Cup than Scott Pelluer. One of his sons, Peyton, is WSU’s starting middle linebacker and his older son, Cooper, played at UW. Scott Pelluer himself played at WSU, as did his dad. But he also coached at UW, and that’s where his brother Steve played. But when Scott Pelluer played in the Apple Cup, the rivalry was more than just a family affair. Pelluer played defensive end and linebacker. His good friend Tom Flick, who was his teammate at Bellevue’s Interlake High, played quarterback for the Huskies. 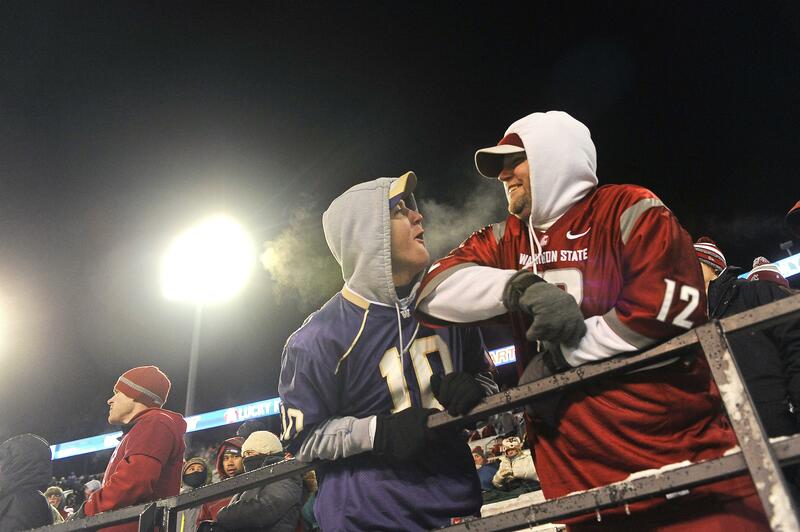 They met in the Apple Cup. Apple Cups are discrete, fleeting chances to create a legacy. Connor Halliday led the Cougars back to their first bowl game in a decade in 2013, but he finished 0-1 in Apple Cups as a starter. He missed his freshman Apple Cup with a lacerated liver, and as a sophomore he got a bad concussion against Arizona State. His senior year ended with a broken leg. Halliday grew up watching the game with his buddies at Lewis and Clark coach Tom Yearout’s house, and dreamed of keeping the trophy on the east side of the state throughout his college years. The school presidents have found ways to make the rivalry meaningful to them, too. Ana Mari Cauce became the UW president in October, 2015, and is known for using Facebook to engage with students. She will add students as friends and comment on their posts and photos, encouraging debate even when the discussion is at odds with her administration’s policies. Twitter has been Kirk Schulz’s preferred engagement platform since he became the WSU president in June. He has used it as a way to bring folks along while he learns about the traditions and culture of his new school. So it only made sense for the traditional bet between the school presidents – a pound of salmon to Schulz if WSU wins, Cougar Gold cheese to UW if the Huskies prevail – have a social media component. Schulz suggested that the loser also take a picture of themselves wearing the opposing school’s colors and tweet it out, adding a significant level of risk for two presidents who are still introducing themselves to their school’s fans. And that’s how this rivalry should be, how it always has been. It is whimsical and fun, more about having the standing to get a rise out of your officemate by poking fun than any actual animosity. But it’s a rivalry that is always there, omnipresent, connecting opposing fans who only thought they did not know each other. Published: Nov. 22, 2016, 2 a.m.